Big gear Change for me! I could predict in almost every condition what the board would do, results were predictable and often very good! The windrange of the CA SP50 is very big, no chop is high enough for this board! I hope this is the right decision, 80lts is my most used size, we will see this year results! Eric the SP50 for me is a much better board i used to own a Falcon 80 great board but abit too flighty,only recently purchased a SP50 and the 3rd time i used it had a max speed of 41.21 and avg of 39.01 knots my best with the F80 was 38knts max. The Carbonart lets your back foot to be closer to the water and this gives excellent control. 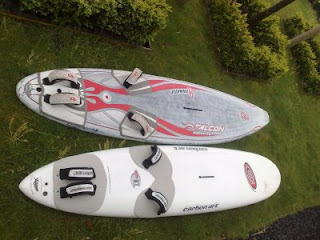 Alot of guys have posted good times on the Falcons but now having purchased the SP50 i wouldn't have any other board. Thank you for this comment! I definitly thought a few times about this big change. Still I am not 100% sure what would be the best choise overall. But I do know that the both boards are superior in different conditions. Especially on tight courses the CA SP50 was good in accelerating (110-130 degrees downwind). Since most of the competitions I am sailing right now are going even deeper downwind the looseness of the Fanatic Falcon 79 is a big advantage. Still I think the CA SP50 can do what the Fanatic Falcon 79 can do and vice verca. Only thing I noticed the CA SP50 requires more finchanges to level out the taillift nicely in different conditions. The first time I used the fanatic falcon 79 it felt quite good. The topspeed was 41.19kn, this was on a lake with square dam. Till that point I never believed a board could accelerate that fast over big increasing chop. I don't think you will have any trouble with the Falcon,like any equipment tuning is the most important thing and tuning to suit you and your sailing style. In the past i had the falcon 91 as well great board in marginal conditions but when it got rough it did become a handful. My current slalom board are Manta 59-67 completely different to the falcons these things eat up the chop the rougher it gets the better they go. You have done a great job on your blog site must congratulate you on this and the articles have been excellent and informative. Thank you Choco for the compliment! I have a good feeling about the fanatic falcon boards. The lowwind efficiency is incredible, and it fits my style of sailing better than I thought. Those Tabou Manta boards are also very good! I think it suits any windsurfer that likes to go fast. 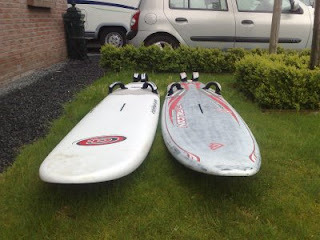 I like the Tabou Manta 54 the best, this board rides really nice. Never have seen anyone out of control on that board even on speed above 35-40kn. With tabou manta concept I really think works very good in overpowered conditions. So I would recommend anyone the small models.